Back in my early blogging days when the word "travel" doesn't seem to have a place in my vocabulary yet, my early posts are actually about heritage and culture. I just love featuring anything in the country that is worth a historical value may it be a person, place or thing. Of all the many figures in the local history, Jose Rizal who is the Philippines' national hero is my favorite. I don't know but I am just really amazed at how this man lived as a genius for accomplishing way too much and not just because he is a martyr and part of Philippine history. He is probably one of the earliest known travelers in the country being able to reach Europe and the US in 1800's. That time travelling is only for the rich clans here in the Philippine archipelago. During college we have an entire subject dedicated to his biography and writings. One of my most favorite parts of his life to study is his love story. That is why when my travel assignment brought me to Dipolog, I made sure that no matter what I need to see this house where Rizal was exiled. With the help of Juliet, one of the local tour guides I have learned so much more details of his life there compared to the snippets of information I have learned from textbook back in college. I was only expecting one house of Rizal which is often depicted online and the one showing above whenever a story about his exile is discussed. When I went there I was totally surprised - Rizal not only had one but six small houses or casetas. He built these for privacy and different purposes. I deeply regret losing the copies of these photos I took which are exact replicas of how he built the ones back then. Casa Redonda - The very first house you will see in the main entrance. This is where he performed the surgical eye operation to his very own mother. Casa Redonda Pequena - As a doctor he often receives in kind from patients who cant afford to pay money. He would usually get animals particularly chickens so he made this house only for this purpose. Casetas De Salud – These are two separate houses built in the elevated part – the first one is for men and second one is for women. It is connected with a wooden bridge that I have forgotten to ask what it is for. Casa Quadrada – This is the house that served as a classroom for young boys. Casa Recidencia - The main house of jose rizal and the one featured abov. He lived here with her ninth girlfriend Josephine Bracken, Dona Teodora his mother, sisters Maria, Narsisa and Trinidad. Note that until today two of the original posts of the house is still there. Rizal's Kitchen - To avoid fire and elevate air, he intentionally built his kitchen away from the main house. Also found there is the bamboo water irrigation system he built that allows the water to flow from the nearby hill straight to his kitchen and to his constituents. There are also two worth-mentioning trees in Rizal's exile place - the paho tree which he himself planted and the Baluno/ Bawuno tree- which is already two hundred years old even older than Rizal. She also explained the composition of his main house which is already 122 years and made of tugas o molave. We were able to see the comfort room made of antipolo pipe this time. There's only one bed room inside his main house. It is said that Rizal's original bed, he gave it to his brightest pupil Jose Asenero. This is also dubbed as the lovers rock because this is where Jose Rizal and Josephine Bracken would see each other. Every afternoon they would go on top of that rock to witness the sunset. This is also the same spot where they exchanged vows with the consent of his mom. The Catholic Church did not allow Josephine and Rizal to get married at the church because of the hero's involvement in the free mason organization. The Church required him retraction to free mason organization. Actually the only reason why Rizal joined that organization because he wanted to condemn the currupt way of the church which is run by the Spanish friars that time. How he and Josephine met? Jsephine arrived in Dapitan in 1895 at the age of 17. She is accompanying her foster father to be operated in the eye. What happened was Josephine and Rizal have fallen inlove with each other. She got pregnant at the age of 18 while Rizal is 35. Unfortunately after 8 months of pregnancy, she gave birth to a premature baby named after his father, Francisco who lived only for 3 hours. The graveyard of Rizal's son is still unknown till today. One says that he buried little Francisco under the stairways of his house. Another one says he buried it at the back of his house. The last one says he buried it near the big tree. Rizal really loved his son so much that in his diary he never wrote where he exacly he buried his son... so be it. What he only mentioned is that during his stay in Dapitan, Rizal is at the happiest state because of Josephine and the baby,.. The Prowlike Extension, is the boat-shape seawall where Rizal took his last footsteps in Dapitan city. It was on July 31, 1896 Rizal finally left Dapitan on board SS ESPANIA together with Josephine and his niece. They are supposed to go to Cuba for a medical mission but when Rizal arrived in Spain the goverment heard bout his travel, they held him on the boat.. and sent to Fort Santiago. He was jailed while his case is undergoing. He was accused of rebellion against the Spanish because of his novels Noli Me Tangere and El Filibusterismo. The night before his execution, Josephine visited Rizal and hugged him to bade her last goodbye. Rizal in turn gave her a souvenir which was captioned "to my dearest unhappy wife, JOSEPHINE" . A few hours after, Rizal was killed at Bagumbayan, Manila, morning of December 30, 1896; at the age of 35. The Spanish government hid his body from his family. One gravedigger witnessed that his body was buried at Paco cemetery. His remains now is transferred to what is called as Rizal Park in Pasay. Rizal arrived in Dapitan on july 17, 1892 at 7 at night. He was with Captain Del Grass and tree artillery men who walked to Santa Cruz bay with farol de combate/lampara and stayed 8 months at Casa Real near the city plaza. He lived there w/ Gov. Ricardo Carnicero his guardia civil. 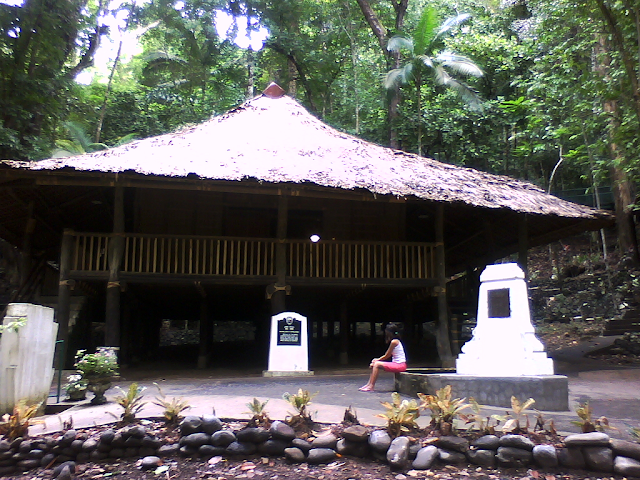 His exile place in Dapitan, 6 hectares of this he gave it to his cook or kusinero, Selistino Acopiado. The 10 hectares is now handed by the National Historical Commission. The 3 hectares was the developed as the Rizal shrine of today and the remaining are part of a forest protected by the DENR. He is really such a genius that during his stay in Dapitan he made the relief map of Mindanao located at the city plAza and the first water irrigation in Dapitan called as aquaduct water system. Aside from being a doctor he was also a teacher, a farmer, a fisher man, a sculptor, an artist, scientist agricuturist and a brother to all Dapitanon people. Because of Rizal's exile, Dapitan is also called as "THE SHRINE CITY OF THE PHILIPPINES. Would like to thank Juliet very much for putting all this information together. I only want to help our students to be able to find quick online answers to their history assignments about this topic.